For the 2000 and 2001 deepwater surveying seasons there were two primary vessels used in the Irish National Seabed Survey - the S.V. Bligh and S.V. Siren. 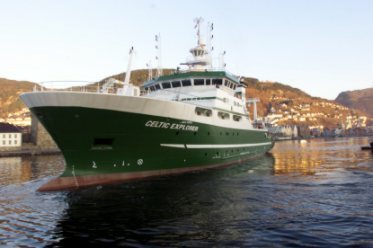 During 2002 the Marine Institute vessel, the Celtic Voyager commenced surveying and now in 2003 the main survey vessel is the newly commissioned Celtic Explorer. Several other vessels have also been used during the course of the Survey to date - listed below are some details. S.V. 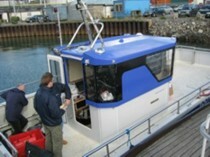 Bligh is a well established ocean-going hydrographic and geophysical survey vessel. She is operated to the highest commercial HSE standards and at present is capable of accommodating 100 people in comfort with excellent on-board survey and processing facilities. During 2001 the Bligh carried out six surveying legs. Each leg was normally of six-week duration and was mostly concentrated in the deeper waters of Zone 3 (200m-4500m water depth). 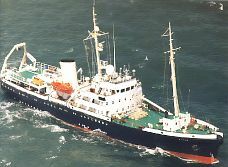 The Bligh was employed to complete Zone 3 in the 2002 surveying season. S.V. Siren is a very manoeuvrable twin screw diesel electric motor vessel with extensive accommodation. She has a proven record in the offshore survey sector, having been engaged extensively in hydrographic/bathymetric survey work and in allied geophysical and geotechnical. 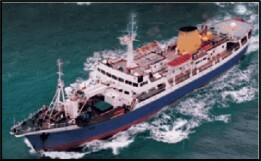 The Siren demobilised on 24 September 2001 after making six four-week long cruises in 2001 concentrating on the shallower waters of Zone 3. Also in 2001 the Marine Institute started preparatory work in Galway Bay for surveying in Zone 2 in 2002. The work was carried out by its existing vessel the Celtic Voyager which then commenced Zone 2 surveying for real in August 2002. 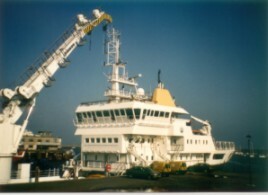 The Voyager also carried out further survey work in October 2003 in Dublin Port extending out to the Burford Bank. The RV Celtic Explorer is Ireland's latest national research vessel. She's a multipurpose research ship designed for deep-sea research (in fact she's Ireland's first deep water research vessel) and can stay at sea for up to 45 days accommodating 12 crew and up to 19 scientists. The laboratories and data management system onboard means that information can be collected and processed at sea and quickly relayed back to G.S.I. for further quality control and additional processing. She commenced surveying in waters of around 200m depth off the Donegal coast in summer 2003. She is an excellent, stable and acoustically quiet survey vessel. Working at an average speed of 8 knots, she is equipped to gather sea floor information utilising state-of-the-art hydrographic and geophysical equipment and is accurately positioned using Fugro StarFix DGPS, which in addition to providing decimetre-accurate positions, includes a sophisticated height correction; permitting the injection of the tidal component into the acoustic data sets. To accurately map the sea floor character and water depth, the vessel is equipped with a Kongsberg Simrad EM1002 multibeam echo sounder and a Kongsberg Simrad EA600 multi-frequency single beam echo sounder. Simultaneous profiles of the shallow sub sea floor geology are acquired using a pinger system. Whilst underway, continuous measurements of the Earth's gravity field are recorded on a LaCoste & Romberg SL Gravity meter, and a Geometrics G881 Magnetometer towfish is also towed aft of the vessel. In June of 2002 the Bligh completed the survey of Zone 3 with her completion of 3G. 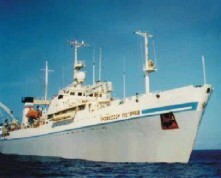 Also during the first half of 2002 the ground-truthing and deep seismic programmes were completed by the R/V Akademic Boris Petrov, the R/V Professor Logachev and the R.V. Ocean Seeker. 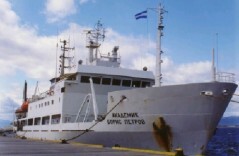 The Logachev was again employed in ground-truthing exercises in September 2003. A final piece of multibeam surveying in the Zone 3 area occurred in 2003 when the British Antartic Survey's vessel the J. Clark Ross was used to infill a triangular gap within the PAD deepwater area using their EM120 multibeam. The PAD - Petroleum Affairs Division - area was surveyed in 1996 to delineate the boundaries of Ireland's offshore area. On 1 October 2003 the Commissioners of Irish Lights Vessel, Granuaile, became the latest vessel to operate within the National Seabed Survey. At first she set off for the distant Rockall Bank to complete a section there of under 200m water depth but she was forced back towards the coast due to inclement weather conditions. An alternative survey area had been determined in advance (since the weather at this time of year is always likely to be adverse) so she came back into the Irish Sea where she surveyed between Carlingford and Drogheda. In March 2004 yet another vessel joined the ever-increasing ranks of the Irish National Seabed Survey Fleet, the Kongsberg Simrad vessel, the ConCat. For details of her survey in Dublin Bay please click here. On a slightly different tack (excuse the pun!) 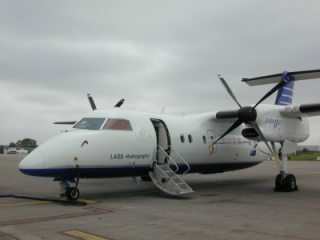 a laser airborne survey (LADS Survey) was undertaken in June 2002 by the Tenix LADS Corporation as part of the National Seabed Survey This took place off the Mayo coast at Clew Bay and its datasets have been confirmed of a very high standard through G.S.I. quality control checking procedures. In 2003 following an open competition Tenix were appointed to carry out a further study extending from Clew Bay into Newport Bay on behalf of a joint venture between GSI and Mayo County Council. The survey will assist the council in its plans to provide a framework for a hydrodynamic model for Newport Bay. For more details on this survey click here.